A comfortable and properly fitted grip is essential to a good release. In addition to adding to your enjoyment of the game and preventing sport injury, a properly fit grip can add revolutions, create more ball speed and make the ball feel lighter. Adding finger and/or thumb inserts to your equipment will also give you consistent feel when using a variety of different bowling balls. 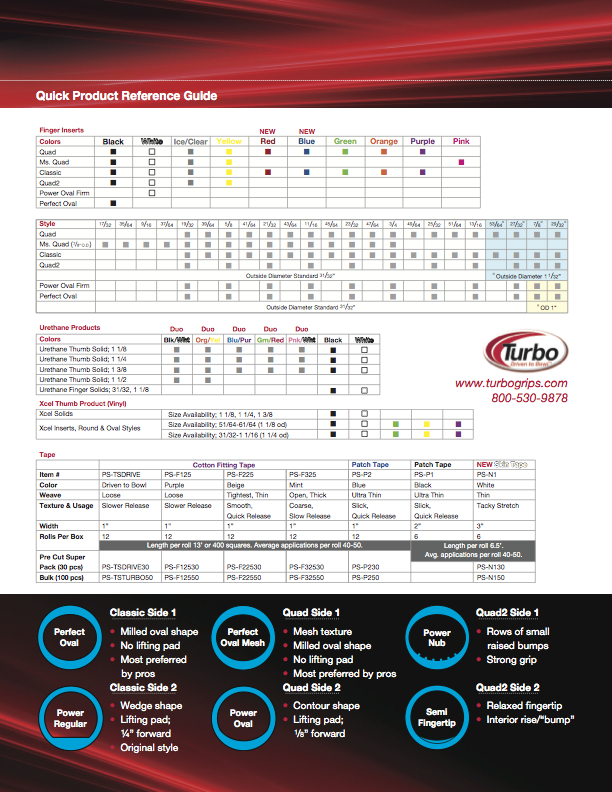 Turbo™ insert products and accessories offers the greatest selection of styles, textures, sizes and colors to ensure you get the fit and feel that's right for you. Available in 19 sizes & 9 colors. The Perfect Oval is designed as a true, milled oval shape. This oval shape is flat through the center and is the most like the shape of your fingertip giving you a very natural and relaxed fit. The Power Regular has 1/4" forward pitch increasing the loft and length of release through the target. The finger pad has a flat edge and smooth surface for a sharp, clean feel. Turbo™ was the innovator of the first Neon or colored grip in 1990, and over 10 years later, it's ironic that we were the first to introduce colorless or clear inserts (2002). Our colorless, clear insert, ICE™ is as cool as it is clever. Available in Quad, MS. Quad, and Quad Classic styles.